Movie Day With Rosie – He Said What?! A few days before Aaron’s birthday, he and I sat across from each other at our kitchen table. He was excitedly telling me of all that he hoped would happen on his birthday…..dinner at Texas Roadhouse and then over to our house for apple pie and ice cream…..and most important, Rosie would be coming…..right, Mom? Then he asked me if Rosie could bring her favorite movie to our house for her and Aaron to watch after they ate pie and ice cream, and after he opened his presents. He was so hopeful about that scenario. I just looked at this man of mine that is still in many ways a child, and I felt a huge lump forming in my throat. I tried to swallow it away, but the lump was also in my heart and that’s not so easy to swallow or wish away. Sometimes I’m slapped in the face with the reality that Aaron wants to have a normal life where he makes his own decisions about things like time with Rosie. Yet he must always involve his parents, because he needs our permission and he needs us to drive and he needs us to accompany him and he needs us to pay for things. How would I handle a life like that? And how do we parents handle our adult children’s desires for a normal life? Those thoughts and emotions were swirling in my head as I heard Aaron ask again if I thought he and Rosie could watch a movie that night of his birthday. As it turned out, they did not get to watch a movie because the night was getting late. He and Rosie seemed fine with that. Aaron was full of talk when they left, worried that Rosie didn’t have fun because she was afraid that our big dog would come upstairs……happy that she got to ride with him in our van to Outback and to our house……happy that Rosie’s mom and dad came, and that they all went upstairs to see his room. So childlike, yet with adult desires, as well. So it was wonderful when Louise called me the next day, and together we planned to take Aaron and Rosie to see the new movie “Big Hero 6.” Aaron and Rosie anticipated it all week, talking and talking about it. Aaron had already seen the movie and he knew that Rosie would like it. And he was just very happy to actually be going to the theater again with Rosie, something that he has missed so much since she started going to another day group. Aaron and I met Rosie and Louise at the theater. There came Rosie, clutching several crayons in her hand and carrying her coloring book. As soon as we were seated in the theater, Rosie proceeded to open her coloring book and color away. Aaron turned to me and started his usual talking, so finally I told him he should talk to Rosie…..and he immediately turned to Rosie and talked while she colored. Then before I knew it he was talking to me…..and I reminded him to talk to Rosie…..and this scene was repeated several times until the movie started. Aaron reached down to get his popcorn when he was satisfied that it was the right time to do that, which must be when the movie starts. I nearly laughed when he held it far away from me in order to be sure that Rosie got first choice of a fist full of popcorn. Louise brought a hamburger to Rosie then, so I took that time to grab some popcorn……but soon Rosie and Aaron were sharing the bucket of kernels again, and I just enjoyed watching their sweet routine that they know all too well from several years of sharing popcorn together. There sat Louise on one end, beside Rosie……and me on the other end, beside Aaron……with our two “kids” between us. It was like we were chaperones. It was fun and dear and sweet. Of course, Aaron laughed too loud and too often, so I did my usual patting of his leg and whispering for him to be quiet. Rosie seemed oblivious to Aaron’s loud laughter. I’m sure she’s completely used to Aaron’s ways. 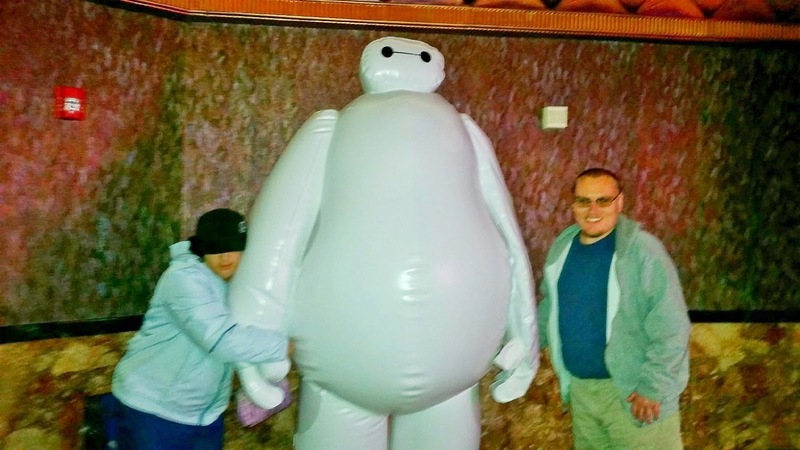 After the movie, as we walked through one of the lobbies, Aaron and Rosie agreed to let Louise take their picture beside Big Hero 6 himself……or sort of. They show their happiness in this picture……adults standing there with a child’s delight. That could also describe me and Louise as well as we laughed, and then as we walked out of the theater together, chattering and laughing in the cold. It was a good day……a sweet day. I’m glad that we took the time to let our kids enjoy this movie day together. Sometimes making these events happen can be a sacrifice of our time as a parent, especially us older parents who look around and realize that most parents our age are well beyond these years……or are doing these things with grandchildren. Yet there are so many harder things we could be forced to do for our special needs children, and I know that we are surely blessed. Blessed, too, to be able to provide a way and a time and a place for our two special ones to enjoy part of a normal life together, participating in an activity that most other friends take for granted. Aaron and Rosie have no idea of the way their happiness helps our mother hearts to feel soothed. That sad lump in my heart was not an issue yesterday. It was replaced by laughter and by joy as I watched Aaron and Rosie have fun doing something totally normal. How do we parents of special needs children handle our adult children’s desires for a normal life? Well, in this case, with a simple movie and some popcorn. Next Next post: The Phantom of the……What?